Now you can enjoy the birds outside the window while drinking coffee, in an unprecedented way. 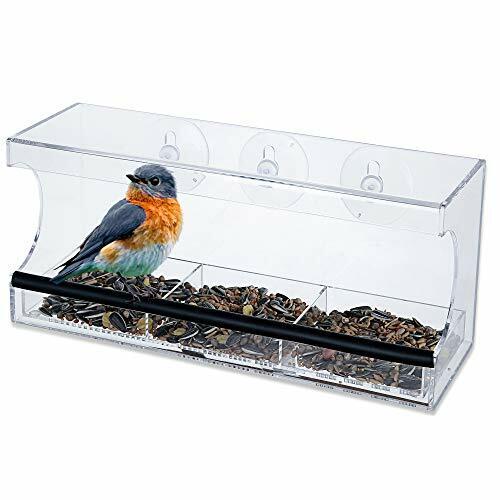 The Luluhome Window Bird Feeder can be easily installed on your window. So you can watch your favorite birds closely. This is a bird feeder that can be hung on outdoor windows all year. The bird feeder designed with drainage holes can keep the seeds dry and prevent moldy. Three strong suction cups can fasten the feeder to the windows, even in extreme weather. You can proudly use this bird feeder as a gift. It can bring more pleasure to your life. Let's share the fun of feeding birds together. BIRD WATCHING: Now you don't need to carry your binoculars to observe birds in the wild, you can do it in your room closely. KEEP SANITARY: Drainage holes in pallets can prevent seeds from keeping moist and growing mold. RAIN-PROOF: The top cover protects birds and seeds from rain and snow. PERFECT GIFT: It's definitely a great gift for bird lovers. Exquisite packaging, exquisite products; enjoy the fun of birds. If you have any questions about this product by Lulu Home, contact us by completing and submitting the form below. If you are looking for a specif part number, please include it with your message.